I must confess that I was not enthusiastic about reviewing this Compact Disc of 1930's Bing Crosby recordings. Now, it is not because I do not like the Old Groaner. Every Christmas as a boy I used to unwrap my presents to the strains of his voice singing Joy to the World and O Little Town of Bethlehem. And I remember my late father arriving home one evening with a box full of 78's and early stereophonic recordings he had borrowed from a colleague - all of Bing. No what put me off was the thought of all that surface noise. A scratchy, hissy recording, sounding as if it had been made in a W.C. So, imagine my surprise when I discovered that the recording engineers at Naxos Nostalgia have recovered the purest most original sound I could have dreamt of. OK it maybe lacks the depth of a modern recording - perhaps the ambience leaves a bit to be desired. But these have, I presume been re-mastered from old 78's or from their master pressings. So what the heck! Listening to this music I could ease myself back in time to an era before the last war and just after the Depression. To a time when the American Dream perhaps seemed a reality. Washing machines, fridges, the private car and even television were becoming a reality for many folk across the United States. There seemed to be a clean-cut image about people and not only on the Yankees home ground. Part of that image in my mind's eye is the 'crooning' of Bing. Harry Lillis Crosby began his career as a bolt on extra to the dance bands - singing the middle eight. However by the time these recording were made he had already shot his first film -The King of Jazz. By 1931 he had his first US Number One with Johnny Green's Out of Nowhere. From then on it was a string of successes. The programme notes tell us that Bing produced 150 chart hits between 1931 and 1939. Not many singers can beat that - either now or then! Now this present CD continues the theme from Volume 1. Lots more hits - old and new; forgotten and remembered. Of course not every number is a standard or perhaps even deserves to be recalled as a song. Yet lovers of Bing will be grateful for any and every new reworking of the old magic. Here we have renditions of Sweet Georgia Brown, Good Night Sweetheart, Lets Put out the Lights, Stardust and Brother Can You Spare a Dime. Hits even I know well! The other artists featured on this album are legion - Victor Young and his Orchestra; Jimmy Grier with his; Harry Barris on the piano, and Lennie Hylton and his band. Here are 18 tracks here of pure nostalgia. 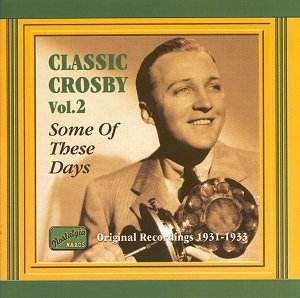 This is a fine CD that all lovers of Bing Crosby will have to own. Now I know that there is so much available on the market. But this is a beautifully produced offering that combined excellent songs with fine re-mastering. And the Old Groaner is in top form! One last the thing: the sleeve notes are excellent - better than many classical CDs. Tells me all I need to know.